10 A None No Power Seat 10 A is a standard Business Class seat, however, the proximity to the galley may be bothersome. 11 A None No Power Seat 11 A is a standard Business Class seat, however, the proximity to the galley may be bothersome. 11 D None No Power Seat 11 D is a standard Business Class seat, however, the proximity to the galley may be bothersome. 11 F None No Power Seat 11 F is a standard Business Class seat, however, the proximity to the galleys may be bothersome. 11 K None No Power Seat 11 K is a standard Business Class seat, however, the proximity to the galleys may be bothersome. 17 D None No Power Seat 17 D is a standard Business Class seat, however, the proximity to the lavatory and galleys may be bothersome. 17 F None No Power Seat 17 F is a standard Business Class seat, however, the proximity to the lavatory and galleys may be bothersome. 19 A None No Power Seat 19 A is a standard Business Class seat, however, the proximity to the bassinet location and galleys may be bothersome. 19 D None No Power Seat 19 D is a standard Business Class seat, however, the proximity to the bassinet locations and galleys may be bothersome. 19 F None No Power Seat 19 F is a standard Business Class seat, however, the proximity to the bassinet locations and galleys may be bothersome. 19 K None No Power Seat 19 K is a standard Business Class seat, however, the proximity to the bassinet location and galleys may be bothersome. 27 F None No Power Seat 27 F is a standard Business Class seat. 28 D None No Power Seat 28 D is a standard Business Class seat. 29 D None No Power Seat 29 D is a standard Business Class seat. 29 F None No Power Seat 29 F is a standard Business Class seat. 31 A None No Power Seat 31 A is a standard Premium Economy Class seat that has extra legroom due to the missing seat in front. 31 C None No Power Seat 31 C is a standard Premium Economy Class seat that has extra legroom due to the missing seat in front. 31 D None No Power Seat 31 D is a standard Premium Economy Class seat that may have extra legroom due to the missing seat in front. However, the proximity to the lavatories and bassinet locations may be bothersome. 31 E None No Power Seat 31 E is a standard Premium Economy Class seat that may have extra legroom due to the missing seat in front. However, the proximity to the lavatories and bassinet locations may be bothersome. 31 F None No Power Seat 31 F is a standard Premium Economy Class seat that may have extra legroom due to the missing seat in front. However, the proximity to the lavatories and bassinet locations may be bothersome. 31 G None No Power Seat 31 G is a standard Premium Economy Class seat that may have extra legroom due to the missing seat in front. However, the proximity to the lavatories and bassinet locations may be bothersome. 31 H None No Power Seat 31 H is a standard Premium Economy Class seat that has extra legroom due to the missing seat in front. 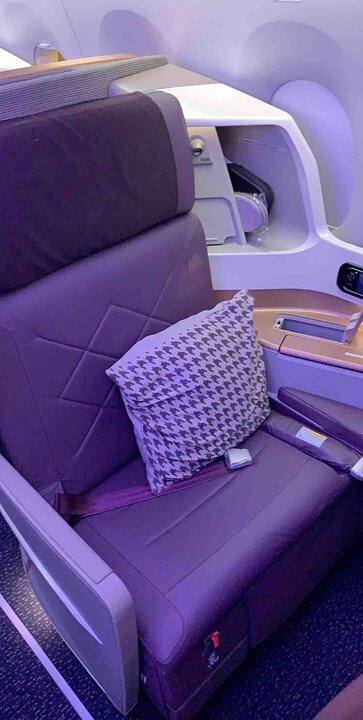 31 K None No Power Seat 31 K is a standard Premium Economy Class seat that has extra legroom due to the missing seat in front. 38 A None No Power Seat 38 A is a standard Premium Economy Class seat. 38 C None No Power Seat 38 C is a standard Premium Economy Class seat. 38 H None No Power Seat 38 H is a standard Premium Economy Class seat. 39 A None No Power Seat 39 A is a standard Premium Economy Class seat. 39 C None No Power Seat 39 C is a standard Premium Economy Class seat. 39 D None No Power Seat 39 D is a standard Premium Economy Class seat. 39 E None No Power Seat 39 E is a standard Premium Economy Class seat. 39 F None No Power Seat 39 F is a standard Premium Economy Class seat. 39 G None No Power Seat 39 G is a standard Premium Economy Class seat. 39 H None No Power Seat 39 H is a standard Premium Economy Class seat. 39 K None No Power Seat 39 K is a standard Premium Economy Class seat. 40 C None No Power Seat 40 C is a standard Premium Economy Class seat. 40 D None No Power Seat 40 D is a standard Premium Economy Class seat. 40 E None No Power Seat 40 E is a standard Premium Economy Class seat. 40 F None No Power Seat 40 F is a standard Premium Economy Class seat. 40 G None No Power Seat 40 G is a standard Premium Economy Class seat. 40 H None No Power Seat 40 H is a standard Premium Economy Class seat. 41 C None No Power Seat 41 C is a standard Premium Economy Class seat. 41 D None No Power Seat 41 D is a standard Premium Economy Class seat. 41 E None No Power Seat 41 E is a standard Premium Economy Class seat. 41 F None No Power Seat 41 F is a standard Premium Economy Class seat. 41 G None No Power Seat 41 G is a standard Premium Economy Class seat. 41 H None No Power Seat 41 H is a standard Premium Economy Class seat. 42 C None No Power Seat 42 C is a standard Premium Economy Class seat, however, other flyers tend to bump into this seat due to the missing seat behind. The proximity to the lavatories and galleys may be bothersome. 42 D None No Power Seat 42 D is a standard Premium Economy Class seat. 42 E None No Power Seat 42 E is a standard Premium Economy Class seat. 42 F None No Power Seat 42 F is a standard Premium Economy Class seat. 42 G None No Power Seat 42 G is a standard Premium Economy Class seat, however, the proximity to the lavatories and galleys may be bothersome. 42 H None No Power Seat 42 H is a standard Premium Economy Class seat is in the last row of the plane, so this seat may have limited to no recline. The proximity to the lavatories and galleys may be bothersome. 43 D None No Power Seat 43 D is a standard Premium Economy Class seat is in the last row of the plane, so this seat may have limited to no recline. The proximity to the lavatories and galleys may be bothersome. 43 E None No Power Seat 43 E is a standard Premium Economy Class seat is in the last row of the plane, so this seat may have limited to no recline. The proximity to the lavatories and galleys may be bothersome. 43 F None No Power Seat 43 F is a standard Premium Economy Class seat is in the last row of the plane, so this seat may have limited to no recline. The proximity to the lavatories and galleys may be bothersome. 43 G None No Power Seat 43 G is a standard Premium Economy Class seat is in the last row of the plane, so this seat may have limited to no recline. The proximity to the lavatories and galleys may be bothersome. Each seat on this aircraft has a 110v AC power port as well as two USB ports. Passengers are able to stay connected to the ground even when they're 30,000 feet in the air thanks to Singapores partnership with SITAONAIR and Panasonic. Price plans vary depending on the WiFi service provider and aircraft type. Singapore Airlines A350-900ULR is used on the world’s longest commercial flight. Traveling 9,500 nonstop miles from New York to Singapore the aircraft is nearly 1,000 miles longer than the previous longest flight ever which flew from Dubai to Panama. This aircraft has a modified fuel system that increases the fuel capacity by 24,000 liters, without requiring additional tanks. This aircraft is more sustainable than previous A350’s in their fleet and has a 25% reduction in fuel burn emission. Singapore’s new A350-900ULR includes aerodynamic performance improvements such as extended winglets. This aircraft has a maximum take-off weight of 280 tons. Additionally, the special Ultra Long Range variety includes noticeable changes in the interior of the aircraft as well. No Economy Class seating is offered on this flight. Instead, in there are 67 Business Class seats and 94 Premium Economy Class seats, totaling a capacity of 161 passengers. Typical seating for this aircraft would be 325 seats. Offering upgraded seating, Singapore introduced a new Business Class product. In the Business Class, the aircraft has a 1-2-1 configuration, while in Premium Economy there is a 2-4-2 configuration. This new, modern aircraft will ensure passengers have a spacious enjoyable flight. Per Sam Chui's video of the inaugural flight (https://www.youtube.com/watch?v=1jVv21yg4qw), Premium Economy seats row 40 and 41 seats C and H are awesome because they are solo seats with no neighbors, and you have a ton of space. 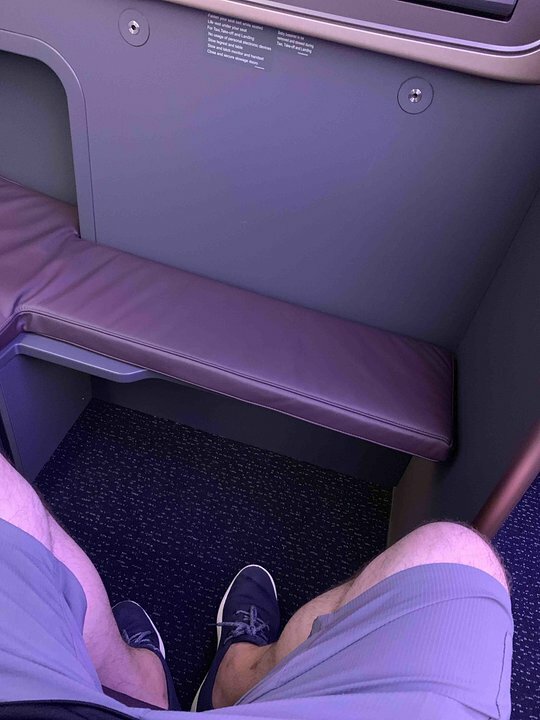 Seats 10A, 11D, 11F, 11K, 19A, 19D, 19F and 19K have two advantages that all other Business Class seats don't have: A wide bench in front in addition to the cubbyhole for one's legs when the bed is extended as well as a wider seat pitch. Proximity to the galley is *NEVER* an issue because unlike noisy crews in other airlines, SQ crew are trained to be very quiet (no loud conversations in the galley) *AND* there is a noise-deadening curtain they draw while in flight (being in seat 11K, I can attest that there is a huge difference between when the curtain is drawn and when it is not).